First Line: Regis Candor took a swig of his beer and watched his neighbor, Jenny Gorman. A fiercely held belief among old-timers is that Glen Canyon was even more beautiful than its relative to the west, the Grand Canyon. To those of us who've seen the Grand Canyon, it defies belief that another could be even more awe-inspiring. None of us will ever be able to form our own opinions, however, because a dam was built on the Colorado River, Lake Powell slowly filled, and the Glen Canyon National Recreation Area was formed. Anna Pigeon's husband is dead, and life as she's known it has ended. In an attempt to escape memories and make a clean start, she decides to become a park ranger and accepts the first opening she's offered. Before she knows it, she's boarded a bus and headed for Page, Arizona, and Lake Powell-- an incredible blaze of colors from the water and the sky to the red sandstone cliffs. She doesn't mix all that much with the other employees, and on a day off she decides to go for a hike... and never returns. Since she wasn't the friendliest of souls, her co-workers think she didn't like the job and has moved on, but that's not the case. Anna wakes up, trapped at the bottom of a natural dry well. She's naked. She has no supplies, and she has no clear memory of how she got in this situation. As Anna slowly pieces things together she realizes that someone has put her in this natural prison and that no one else even knows that she's missing. If she's to survive, this city girl is going to have to survive, to outwit her captor, and to emerge triumphant. The alternative is unthinkable. Once again Nevada Barr hits a home run. Her setting is a land of incredible beauty, and she's a master of putting her readers right in the middle of the place she's chosen-- not just with breathtaking descriptions, but with facts. It's evident that Barr is as sickened as I am with how visitors treat the area, and some of her facts made me glad that I never tested the waters during any of my visits there. This prequel was a sheer delight to read, allowing me to see Anna as she was at the very beginning and to watch her develop into the character I've come to love and trust. If you haven't read any of the Anna Pigeon books yet and you're wondering if you should read them in order of publication (starting with Track of the Cat) or in chronological order with The Rope, you could do it either way. (Personally I would prefer order of publication.) For those of you who have no intentions of committing to the entire series, please don't pass up the opportunity to read this book. If you read the last book in the series, Burn, and did not care for the violence or the rather graphic subject matter, you don't have to worry about it in this book even though your antennae probably twitched at the words "naked, at the bottom of a well." Just sit back, relax, and enjoy this story about our Anna at the very beginning. The Rope at The Book Depository. The Rope at Your Favorite Indie Bookseller. I'm reading them in order of publication and have book three on my shelves to read when I'm ready. Love Anna Pigeon... best discovery of 2011. 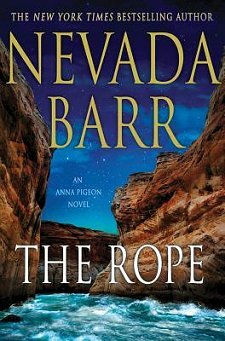 Nevada Barr is one my favorite thriller, mystery novelists. This one looks like one I'd enjoy. I love her outdoor adventures. I really want to try one of Barr's books and now I have to decide if I should consider the series or just try this book. Great review! Cath-- I'm so glad you're enjoying her books. I had the opportunity of seeing Nevada Barr in action at a book signing... what an enjoyable evening! Harvee-- I do, too. Reading her books are the next best thing to visiting the places myself. Kathy-- In your case, I would advise reading this book. Dorte-- I think that would be a good idea. This way you'll see her at the very beginning and be able to judge if you want to broaden your acquaintance. I thought this was the best Anna Pigeon of all and I've read every single one. It's interesting to see how Anna, newly widowed, manages to learn about Glen Canyon and develop into the park ranger we all know and love. I've read every single one, too, Barbara! Sounds good, I am sure I have read a few from the series but quite some time ago. Bernadette-- My husband is hooked on audio books. Something in my brain just won't let me add them to my repertoire. Shelleyrae-- It's one of the few series I'm caught up with, and that's the way to tell if it's a favorite of mine or not! Margot-- I knew some of her readers would be concerned about that. I think the last Nevada Barr book I read was Flashback. Interestingly, I read it around the same time that my family visited the fort where the story was set. The next of hers I tried to read was one set in winter, where there was a male character (crudely mouthing off about some woman he'd been with) that I developed such an immediate and intense dislike of that I dropped the book then and there. I haven't read anything of hers since. Maybe I'll have to give this one a try, if she's returned to earlier form.